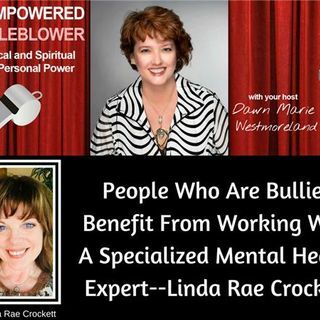 Linda Rae Crockett: As a Registered Masters Degree Social Worker with 30 years of experience, I worked with thousands of individuals & families through a wide variety of life circumstances. This includes bullying: all ages, professions, and cultures. I have worked with all forms of abuse (verbal, psychological, physical, emotional, financial and sexual abuse). Addictions (i.e. : substances, food ) and I have also worked with people suffering from physical illness for example: cancer, ... See More chronic pain, fibromyalgia. I am skilled at providing support & guidance to those experiencing grief & loss as a result of dying and death, suicide, job loss, and many forms of loss. I believe that discovering 'self' is key to creating personal boundaries, improving personal decision making & problem solving skills and choosing actions more focused on the best interest of you and those you love. Building self awareness & self insight is essential for self esteem, self worth & self respect to heal & strengthen. I am a social worker trained to offer clinical practice, offering a holistic assessment of my clients circumstances. I will also identify appropriate resources by listening to each aspect of your story. I identify patterns themes & connect aspects of your story so that a deeper understanding is found. I offer empathic support & guidance.